A crazy maniac budding entrepreneur is looking to Kickstarter to raise $26,400 so he can buy a whole bunch of Lego bricks. With those Lego bricks, the Portland, Oregon-based Zachary Pollock hopes to recreate level 1-1 of Super Mario Bros. in its entirety. The whole thing. Pollock estimates that the whole project will take "780,000 lego studs." He says it will be six feet tall and 90 feet wide. "I want to inspire a new generation of Lego enthusiasts," Pollock writes. "I also want to show people what they have forgotten, that building with Lego can be done at any age. My second goal is to use this project to test the waters for a foundation I would like to start that will work with children doing healing art projects using Lego bricks. This project aims to push the limits of imagination about what you can do with Lego bricks and particularly to break down stereotypes people have about both Lego and video games only being toys. 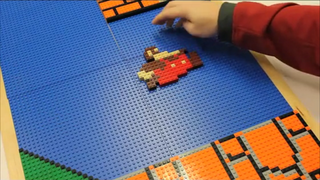 "I want to show the world Lego and video games can be works of art as well. Last but certainly not least I, and I think many other people, really want to see the entire level 1-1 of Super Mario Bros. made from Lego because it is just FUN! Right now I think we all need a little more fun in our lives." Preach it, Pollock. We all totally need more fun in our lives.